Organic substrates including algae, moss, macro-phytes, dead leaves, and wood vary greatly in size, the conditions where they occur (depth, current, stream size) and in their temporal persistence. Small organic particles <1 mm usually serve as food rather than as substrate, except perhaps for the smallest invertebrates and microorganisms. Macroinvertebrates generally are more abundant where greater amounts of fine organic matter occur on the surfaces of mineral substrates, within their interstices, and in depo-sitional zones behind obstructions. Autumn-shed leaves and the fungi and bacteria they support are a major energy source, especially in woodland streams (Chapter 7), and often are most abundant in depositional zones where fine particles are trapped as well. 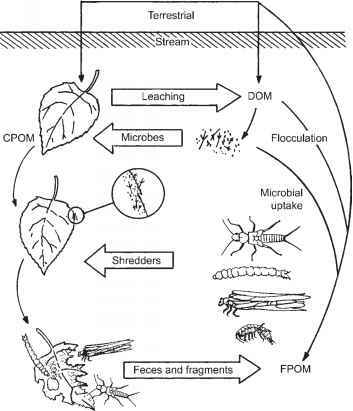 Thus aggregations of leaves on the streambed provide both food and habitat and typically support a high abundance and diversity of invertebrates (Mackay and Kalff 1969). On the other hand, higher plants and submerged wood are consumed by only a few specialists, and support high animal abundances because these large organic substrates serve as perches from which to capture food items transported in the water column, as sites where fine detrital material accumulates, and as surfaces for algal and biofilm growth. The presence of wood in streams also adds substantially to mesoscale habitat complexity, acting both as a geomorphic agent influencing channel shape and pool formation (Chapter 3), and directly as habitat. The invertebrate taxa that live in association with aquatic plants are referred to as phytophi-lous. A number of species are found primarily on moss, including the free-living caddis larva Rhya-cophila verrula and a number of mayflies with backward-directed dorsal spines that are thought to minimize entanglement (Hynes 1970). Most commonly, mosses and filamentous algae provide habitat, serving as a refuge and a trap for silt and organic matter, rather than a direct food source (e.g., Steinman and Boston 1993, Downes et al. 1998). Submerged macrophytes add to the physical complexity of the environment, creating habitat that algae and invertebrates may colonize (Tokeshi and Pinder 1985) and providing refuge for fishes from high flows and predators (Grenouillet et al. 2000, Harrison et al. 2005). These effects can operate at very fine scales associated with leaf surfaces and plant architecture up to the coarser scale of a macrophyte patch. Using both natural and artificial macro-phytes, Taniguchi et al. (2003) showed that greater architectural complexity of habitat led to a higher number of macroinvertebrate taxa. The mechanisms may include greater living space, detritus trapping, and altered microhabitat conditions. Xylophilous or wood-dwelling taxa attest that wood constitutes yet another substrate category of lotic environments. In the headwater streams of forested areas, as much as one quarter to one half of the streambed can be wood and wood-created habitat (Anderson and Sedell 1979). Dudley and Anderson (1982) considered 52 taxa in the northwestern United States to be closely associated with wood, and another 129 to be facultatively associated. Even in agricultural streams in the midwestern United States where wood was not abundant, the majority of the recorded taxa (~90%) used wood as habitat, and the presence of wood substantially increased the number of taxa at a site (Johnson et al. 2003). Wood appears to be substrate more often than it is food, although some taxa, such as the beetle Lara avara, feed mainly on wood. However, this beetle has the slowest growth rate and longest life cycle of all stream insects (Huryn and Wallace 2000). Many wood-associated taxa obtain their nourishment from biofilms occurring on wood surfaces (Hax and Golliday 1993). In lowland rivers where the substrate is largely sand, fallen trees (snags) are especially important as a substrate. In the Satilla River, Georgia, Benke et al. (1985) estimated that snag, mud, and sand substrates occurred in the ratio 1:1.4:14 at an upriver site, and 1:3.6:18 at a downriver site. However, snags supported more taxa and a far higher biomass of invertebrates than did mud, where values were higher than in sand (Table 5.2). Interestingly, total numbers per unit area did not differ markedly between snags and sand. However, the invertebrates in the sand substrate were mostly oligo-chaetes and psammophilous midges of very small size, and so their biomass was modest. Integrating among all habitats in the river channel, snag surfaces accounted for over half of the invertebrate biomass. Because sand made up 70-80% of the substrate, it was responsible for most of the remaining biomass despite a low biomass per unit area. A number of species of fishes and other vertebrates of rivers tend to occur on or near particular substrates, and some fishes are quite specialized in their affinities. For example, the mud darter Etheostoma asprigene is restricted primarily to the backwaters of larger tributaries of the Mississippi River, the southern sand darter Ammocrypta meridiana to clean, sandy substrates of the Mobile River basin, and the Blenny darter E. blennius to the gravel and rubble bottom of fast riffles in Tennessee River tributaries (Lee et al. 1980). Bottom substrate is important to many freshwater fishes when spawning because eggs require an adequate supply of oxygen and protection from predators, for which gravel is well suited. The majority of freshwater fish select stony substrates for reproduction, from individual large stones to some mix of gravel (Balon 1981). An advantage of coarse mineral substrates is that they can be sculpted into nests where eggs and sperm can mix without being swept away by the current. In addition, because water flows into the interstices of coarse substrates, ample oxygen is transported to buried eggs. Mineral substrates also allow behavioral elaboration. A number of species move rocks or pebbles with their mouths: the North American chub Nocomis erect structures as much as 30 cm in height and 1 m in diameter to attract mates. In addition to lithophilous fishes, a number of freshwater species are psam-mophilous or phytophilous. A few species such as the log perch Percina caprodes spawn in sand, depositing sticky eggs that become camouflaged with a sandy coating. Among the species-diverse darters, examples also exist of species that spawn on such specialized surfaces as rotting vegetation (E. exile), the macroalga Cladophora (E. blennioides), and other rooted plants (E. lepidum, E. punctulatum) (Hynes 1970). Aquatic insects also select particular substrates for oviposition. Egg masses of the mayfly Baetis were highly aggregated under protruding stones with specific characteristics associated with lower probabilities of desiccation in a Rocky Mountain stream (Encalada and Peckarsky 2006). Similarly, hydrobiosid caddis flies were observed to lay their eggs in single masses beneath emergent rocks in an upland Australian stream, and ''landing pad size'' was thought to influence ovi-position choice (Reich and Downes 2003).